The easy way to enjoy Phillip Islands’ nature, wildlife, fun, entertainment and chocolate. 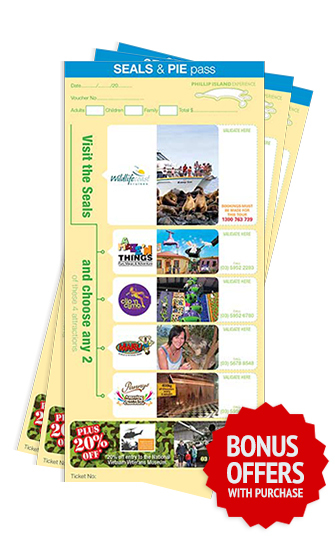 Just purchase your Seals & PIE pass and present the ticket at the 2 attractions you most wish to see. Then present your ticket at Wildlife Coast Cruises for a Seal Watching Cruise. Please Note: For Seal cruises times and dates visit www.wildlifecoastcruises.com.au/seal-watching-cruise/, it’s advised to pre-book your Seal Watching Cruises on the day of tour or earlier, call 1300 763 739.